This article is the second in a series concerning the ocular surface. The tear film plays a critical role in the health of eye and a number of ocular disorders can affect the tear film. The tear film break-up time (TFBUT) test is used to analyze the stability of the tear film and its evaporative rate. The test determines the amount of time for dry spots to appear on a corneal surface following blinking. Sodium fluorescein is instilled in an eye followed by illumination with blue light (wavelength of 465 to 490 nm). The illuminated cornea is observed under slit-lamp magnification for fluorescein fluorescence (green-yellow light of 520 to 530 nm). A darkened non-fluorescent area is considered a dry spot (a disruption of a normally continuous tear film). Using this test, healthy dogs and cats typically reveal dry spots about 20 seconds following their last act of blinking. The innermost layer of the tear film connects the glycocalyx of corneal epithelia with mucins secreted by goblet cells. This mucous layer is critical in adhering the tear film to the cornea. It connects the hydrophobic cells of the cornea with the hydrophilic aqueous layer of the tear film. A very fast TFBUT (less than 1 second), with a normal Schirmer tear test value of 15 mm/min, may indicate that the tear film is not forming properly, and this suggests that components of the corneal glycocalyx and/or mucin levels are deficient. Typically tear film abnormalities associated with the corneal glycocalyx layer are localized to discrete areas of the cornea, whereas those associated with mucins are more diffuse. Common problems that disrupt the glycocalyx include corneal sequestrums (Figure 1), ulcerations, and mineralizations. Each of these disorders usually presents within discrete areas of the corneal surface where the glycocalyx has been disrupted. For example, a corneal ulceration generates a dry spot that will retain debris and bacteria that would normally be cleared by an intact tear film. Corneal sequestrums, ulcerations, and mineralizations are therefore treated with lubricants in addition to other medications and/or surgical procedures. As examples: a sequestrum is lubricated with artifical tears prior to keratectomy; an ulceration is treated with a lubricating ointment of neomycin-polymyxin and bacitracin until it heals; and a mineralization is treated with a lubricating ointment of EDTA prior to a burr keratectomy. Goblet cells produce most of the mucins within the tear film, but some are derived from corneal epithelia. The act of blinking spreads these mucins across the corneal surface. Mucins are “sticky” hydrophilic carbohydrates that form a physical barrier to bacterial adherence. The initial stages of clearing bacteria from the ocular surface include mucins coating the invaders. Mucins are therefore critical in preventing bacterial infection of the eye. A reduction in aqueous tear production and ocular surface inflammation are the two most common causes for tear film mucin deficiencies seen in dogs. More rarely vitamin A deficiency, excessive instillations of ocular medications (with preservatives), or cicatricial conjunctival disease has been associated with decreased mucin production and/or goblet cell numbers. There are no commercially available therapeutics that restore mucin production in the eye. Alcon is currently developing some medications to increase mucin production, and using mucins derived from other animals (such as the giant Nomura jellyfish) is also being considered. However, today clinicians can only treat the disorders that lead to mucin deficiencies. Therefore, cyclosporine is prescribed to increase aqueous tear production while steroids are prescribed to reduce ocular surface inflammation. In my next article, I will discuss how specific diseases affect the lipid layer of the tear film and what appropriate treatments can be used to restore ocular surface health. If you have any questions about the ocular surface, or ocular surface disorders, please feel free to ask a veterinary ophthalmologist. 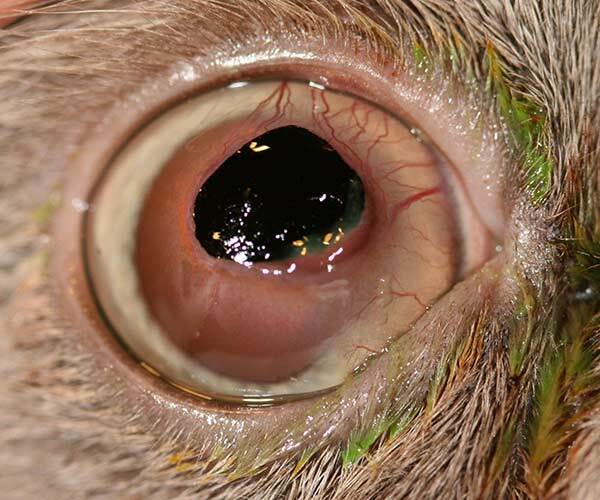 Figure 1: A corneal sequestrum on the right eye of a 5 year old castrated male Himalayan cat.